Having a trampoline at home can be fun for you and your family, but it also promotes good health. Studies have shown that jumping on a trampoline is similar to jogging. It provides a good cardio workout, increasing blood flow and lung capacity, as well as lowering a person’s blood pressure. You can read more about trampoline exercises here. When selecting a trampoline, it is imperative to select a trampoline with as many safety features as possible. Moreover, you want to look for one that has been repeatedly tested to make sure that the risk of injury is low. Over the years, trampolines have been constructed with safety features such as net enclosures, as well as padding covering the frame and springs. However, it is important to note that most trampoline injuries are the result of misusing the apparatus, not from design failure. This is why it is important to note that, especially with small children, supervision at all times is a must. If your family is looking to purchase a trampoline, it is best to purchasing one on the market that has several safety features. When you start looking at the wide selection of trampolines, it can seem that they all seem similar, but if you are looking for the best, you will want to choose one that possess durability and strength. When you know what to look for, it makes your buying choice of a new trampoline that much simpler. Along with the new trampoline, you will want to consider accessories as well. With the new trampolines today, safety accessories might or might not be included. However, especially if you have small children, you will want to have available accessories like a ladder, extra padding, and an anchor kit. Below are reviews on some of the top rated trampolines on the market today. The first feature you will notice about the Skywalker 15 Feet Round Trampoline is that it comes with a net enclosure that is securely attached to the jumping mat. What makes this net enclosure more secure than other similar trampolines is that the V-rings allows for no gaps in the enclosure. 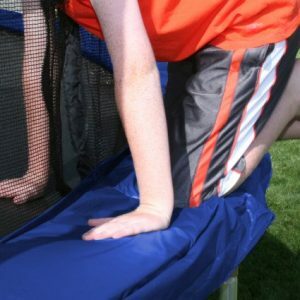 The welded T-sockets sturdily attaches the enclosure frame to the trampoline frame, eliminating the possibility of the upper enclosure from twisting and turning. The weight limit is 200 lbs. All the parts of the Skywalker 15 Feet Round Trampoline are UV protected to resist against weather damage, which is excellent if you plan on leaving your trampoline out in the yard year-round. The ExacMe 15ft. 6W Legs Trampoline w/Safety Pad and Enclosure Net has six wide galvanized steel legs to keep it firmly on the ground and preventing it from wobbling or tipping over. The 12 contact points these legs create adds to the stability and durability of this apparatus. The safety net is secured to the trampoline with sturdy, strong ropes and straps. The net door has a zipper for easy opening and closing. Additionally, this trampoline comes with its own ladder, so little ones and seniors can access the enclosed area with no difficulty. If you mechanically challenged, you will be happy to know that the Upper Bounce Trampoline requires no hardware to assemble. The assembly is also made simple with the poles constructed to come apart quite easily, which is especially nice if you need to put the trampoline away during the winter. The galvanized steel frame and legs are covered with a powder-coat substance that acts as an agent against rusting, but it makes the appearance of this trampoline more appealing to consumers. The net and mat are created with strong, premium polypropylene mesh that has eight rows of stitching for added security. The thick, superior-quality safety pads surrounding the frame prevents injury if someone falls on it. Entry into the net closure is accomplished by the net door held in place with a zipper and buckles. The high-quality net enclosure is constructed with 100% top-notch terylene mesh for maximum security. Upper Bounce trampolines are available in a wide range of sizes, from 7.5 feet to 16 feet.